Of all years to offer $1 billion for a perfect bracket, Warren Buffet picked a really good year. As hard as it is to go perfect any year, 2014 proved to be the most difficult of all time. There are many ways to calculate how surprising a March Madness tournament is. The simplest way is to count the number of times a lower seed beat a higher seed. However, that counts #9 Pittsburgh crushing #8 Colorado the exact same as #14 Mercer shocking #3 Duke. On the more complex end, it is possible to use advanced statistics to calculate the likelihoods of each team winning the tournament, and then compare the model to what actually occurred. I will settle for something in between – a method simple enough that it’s easy to follow and grasp intuitively, but slightly more complex than the simple “counting upsets” idea. 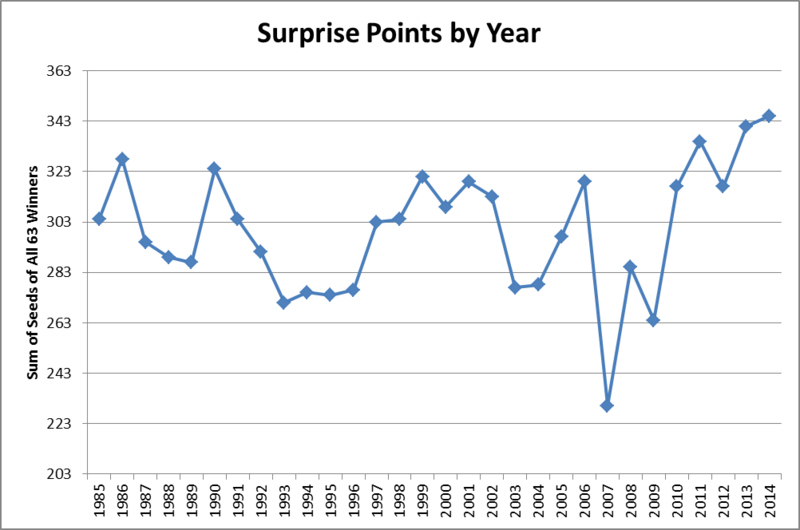 In this post, I will define how “surprising” a tournament is as the sum of all seeds of the winners of all 63 games. For example, this year’s Final Four and Championship game saw wins by #7 Connecticut, #8 Kentucky, and then another win by #7 Connecticut. So, the three games in Arlington add 7 + 8 + 7 = 22 “surprise points” to this year’s total. Do the same thing for the remaining 60 games, and we get a grand total of 345. This method, while easy enough to follow, has the advantages of a sliding scale by seed (a 15-over-2 contributes more than an 11-over-6) and a sliding scale by round (a 14-seed winning two games increases the total more than a 14-seed winning just once). This year’s tournament was very solid for upsets from start to finish – three #12s, and a #14 all advanced; a pair of #11s made it to the Sweet 16 and Elite 8; a #10 made it to the Sweet 16; and then the 7-8-7 championship weekend really put 2014 over the top. 2011 might be among the most famous tournament for upsets, thanks to its Final Four featuring #8 Butler and #11 VCU, but the last two years had slightly more upsets top-to-bottom by this measure. For what it’s worth, though it’s a small sample size, UConn and Louisville seem to thrive on bracket chaos. How does 2007 have such a giant lead? Frankly, it was a historically boring year for fans of underdogs. There were only three teams to overcome a seed deficit larger than three: #11 Winthrop, #11 VCU, and #7 UNLV (in round two). While it is certainly possible to have a very unsurprising year overall and still have a non-one-seed win the tournament, it makes sense that all of the top six on that list feature top-seeded champions. The bottom of this graph is 203 because that’s the lowest possible value: add up the numbers 1 through 8, 1 through 4, 1, 2, and 1, and you’ll get 50 for a region without a single upset. (Interestingly, that’s only happened once – the East region back in 1985, the first year of the modern setup). Multiply by four for the four regions, and then add 3 for victories by #1s in the Final Four and Championship game. There is a slight upward trend over the past 30 years, but it is not statistically significant. That said, I think that an upward trend would be a great thing for the sport – and not just because I happen to attend one of those mid-majors that has pulled off an upset each of the last two years. Underdogs winning in March add excitement to college basketball and an extra reason to love the game, and that’s really what it’s all about. Well, assuming you don’t manage to win $1 billion, that is. NCAA Basketball: Do Underdogs Play Better in Rivalry Games? Is Harvard going back to the NCAA Tournament?